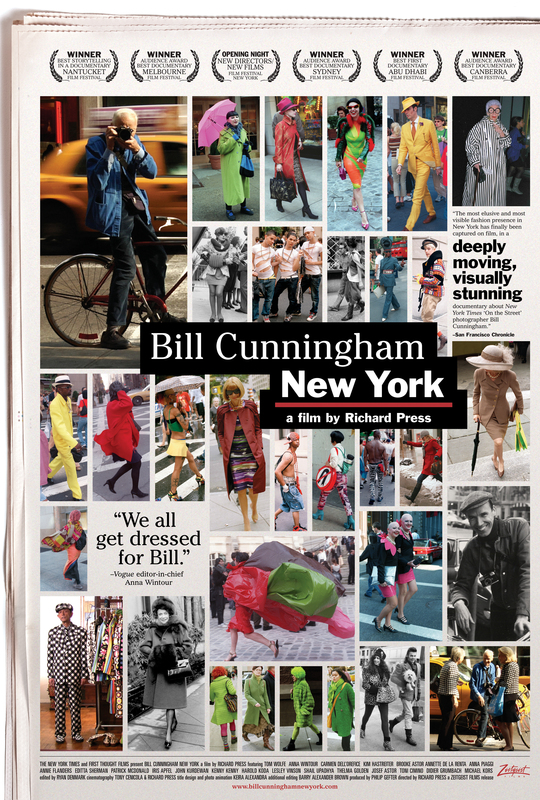 If Bill Cunningham ever saw this post, he’d probably laugh and say, “Child, I’m no hero!” But that would be typical of Bill to downplay his accomplishments and his incredible career capturing and documenting decades of fashion and beauty for The New York Times. I saw the documentary Bill Cunningham New York this summer (at the Crest Cinema no less). Immediately, within the first few minutes, I was mesmerized by this 80+-year-old modern day monk in a French working man’s bright blue coat, riding a Schwinn bicycle through the pandemonium that is Manhattan, snapping photos at every turn. Here’s what the film is about, quoted directly from their web site. Bill lives in a modest apartment filled to the hilt with file cabinets full of photo archives. He has no need for a kitchen because he doesn’t cook. He eats out for all of his meals and likes “simple things” like an egg toast sandwich and coffee. Even though he photographs beautiful clothes all over New York, he has just a few utilitarian pieces for himself. Every day, he photographs people, often working from morning until late at night. He loves his work and at 80+ years old, he’s still going strong. I love the quote Bill says while receiving a momentous honor in France: “He who seeks beauty will find it.” His life is a manifestation of the Super Frug philosophy of knowing what is important to you. Bill is a shining example of how you don’t have to be rich to have a remarkable life. Hats off to you, Bill! agreed! heard a story about him on slateculturegabfest. he is amazing! You’ve got to see the movie, Noell! You’ll love it. What a beautifully written review, Peg! Love the quote about Beauty. I’m curious how many photos he keeps in paper format and how many in digital format? Do you know if he uses a digital or film camera? Thanks, Laila! Glad you enjoyed this post. Bill uses a film camera and I think he does keep most of his photos in paper format (see all the file cabinets in his apt!). You’ll see in the movie that he works with a NY Times staff member to put together his “On the Street” photo collage at the NY Times office. It’s a pretty funny scene. Hope you get a chance to see the movie soon. So he’s a hold out, huh? I can’t imagine using film now when digital is so much cheaper. Excellent, Laila! You’ll have to let me know what you and Matt think of the movie.